Wash your hands thoroughly with soap and water. Do not touch the reservoir needle, open end of the reservoir, end of the infusion set, or top of the insulin bottle. For close viewing, hold your reservoir or infusion set at eye level above your nose. Many germs reside in the nose and breath, so do not breathe or blow directly on the pump, the reservoir, the infusion set or the infusion site. An alcohol pad is adequate to cleanse the skin for many, but it is not strong enough if you carry staph. For staph carriers or if you are not sure, scrub the skin at the new infusion site with an antiseptic product. IV Prep or Betadine™ pads are convenient, or you can use bottled products such as Betadine™ Solution (iodine) or Hibiclens™ (chlorhexidine). Start at the center of the area and rotate the pad or swab in a circular fashion away from the center and do not go back. A cleansed area about three inches in diameter is needed.For staph carriers, as well as for extra safety or for those who are allergic to set adhesives, place a bio-occlusive adhesive dressing like IV 3000™ or J&J Bioclusive Transparent Dressing™ over the site as soon as it dries. Unlike a standard adhesive, a bio-occlusive adhesive can seal sterilized skin to prevent bacteria from gaining access to the infusion site. The set or pump is then inserted through the bio-occlusive dressing. We’ve done it again! 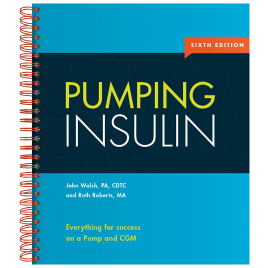 The 6th edition of Pumping Insulin: Everything For Success on a Pump and CGM is updated with 60 fewer pages, new material in a more concise format, and a spiral binding for easy use.